IT support services for businesses in North Wales, Chester, Wrexham and surrounding areas. CRB/DBS e-Bulk approved System Developers. Professional and reliable. The web server used by Citsltd.co.uk is located in Great Britain and run by Heart Internet Ltd. On this web server 97 other websites are hosted. The language of those websites is mostly english. 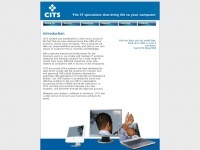 The webpages of Citsltd.co.uk were developed using the programming language PHP. For managing the data of the webpages the CMS WordPress in the version 4.7.10 is used. The website uses the latest markup standard HTML 5. The website prohibits search engines and webcrawlers indexing the website. Other actions by webcrawlers and bots are allowed.